2013 marks the centennial of one of the most devastating natural disasters ever to hit the United States. In late March of 1913, a uniquely destructive system of ravaging storms swept across the American Midwest and parts of New England. The storms brought with them high-speed winds and torrential rains, causing tornadoes and massive flooding. By the time the storms had passed through the area, they had caused billions of dollars’ worth of damage. The week of storming killed hundreds of people and left thousands more homeless. These storms changed the paths of millions of lives, one of whom was Governor James M. Cox. James M. Cox was born on March 21, 1870 in Jacksonburg, Ohio. Cox spent his formative years in Ohio, where after just two years of high school, he passed the teachers' examination and began teaching. After establishing himself as an educator, he became the owner and publisher of the Dayton Daily News at the age of 28. In 1909 Cox shifted careers again, this time by becoming the representative for Ohio in the House. He remained in that position until January 1913, when he was elected Governor of Ohio. 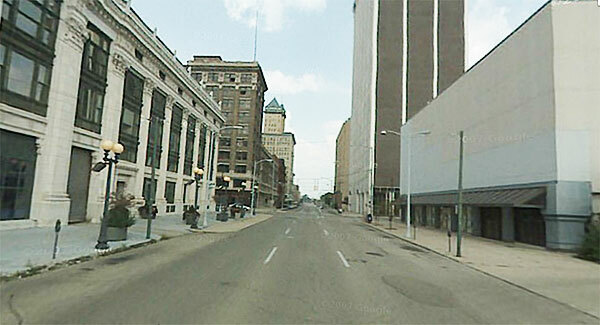 Fourth & Main - then and now. 134 W. Fourth St. - Then and now. Only 3 months into his term as Governor, Cox was charged with handling one of the biggest natural disasters to ever occur in the United States. Governor Cox won much support and admiration for his handling of the aftermath from the storms during the week of March 21st through 27th of 1913. Cox remained abreast of the situation thanks to telephone operator John Bell, who contacted the Governor every half hour with new details. 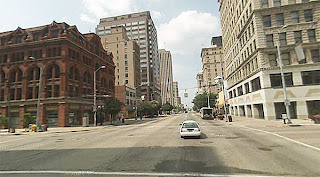 By the next morning Cox had the Ohio National Guard on the ground in the city along with 650 boats he had shipped to Dayton from Salem for the rescue efforts. Cox’s display of dedication to the people, as well as the strength in his convictions, garnered him enough national attention to join the 1920 race for President of the United States, with Franklin Roosevelt as his running mate. Though he was not elected President, Cox’s media empire –founded in the years following the election – enjoyed much success. Cox Enterprises remains a multi-billion dollar media company to this day. Cox died on July 15, 1957 at the age of 87, and was buried in Woodlawn Cemetery in Dayton, Ohio, leaving behind his wife, two children and ex-wife. 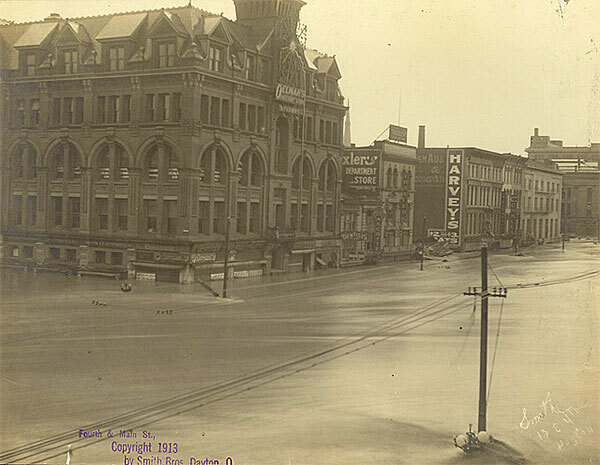 By the time the flooding had begun to end on March 26th 1913, the damage was widespread. 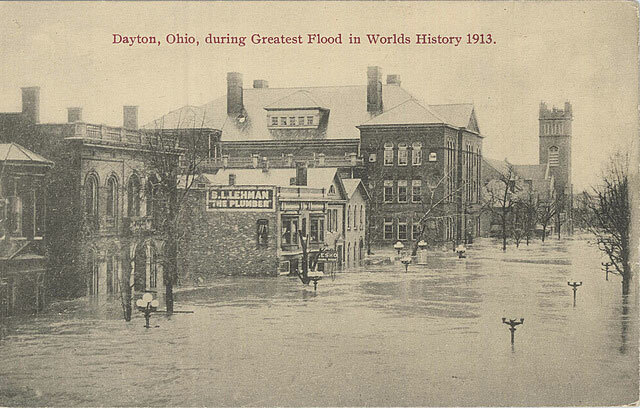 14 square miles of the Dayton were underwater, and more than 360 people were dead. Some 20,000 homes were completely destroyed, an estimated 65,000 people were left homeless, and all told, the city had suffered close to $100 million ($2 billion in today’s dollars) worth of damage. The cleanup effort took more than a year to complete and Dayton’s economy didn’t make it back to pre-flood levels until more than a decade after the disaster. Thanks so much to Virgil Hervey for letting us share a piece of this historical project on A Yellow Springs Blog. We’re humbled by the interest in this project, and we really hope you enjoyed this snippet of history! 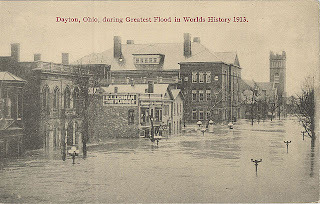 We’d also like to thank some of the great archives and archivists who have done so much to work to help preserve the amazing history of the 1913 flood, including the Dayton MetroLibrary and historian TrudyBell. The amount of history compiled at these two websites is truly amazing. Lastly, thanks to Jason from InsuranceTown.com who lent us some of the resources we used to help prepare content for the web and publish our blog, and inspired our Mapping History Contest. Don’t forget to check out HistoricNaturalDisasters.com for more images, and for information on our MappingHistory Contest – help us figure out the locations pictured in historic photos from 1913 and you could win $100!